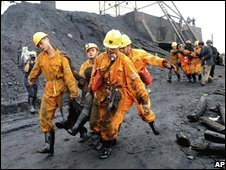 At least 35 people have been killed and 44 are missing after a deadly blast in a coal mine in China's Henan province. The State Administration of Work Safety said the pre-dawn gas explosion happened at Xinhua No 4 pit in Pingdingshan city. China's mines are the most deadly in the world - thousands of workers are killed in them every year. Most accidents are blamed on failures to follow safety rules, including a lack of required ventilation or fire control equipment. A spokesman for the city's Communist Party committee said the Xinhua No 4 pit was undergoing renovations, and had not yet been authorised by the city government to resume operations. Official figures show that more than 3,200 workers died in collieries last year, but independent labour groups say the actual figure could be much higher, as many accidents are allegedly covered up in order to avoid costly mine shutdowns. Coal is the source of about 70% of the country's energy. Luo Lin, chief of China's State Administration of Work Safety, said on Saturday that officials would shut down about 1,000 small coal mines this year, in an attempt to improve management and safety. Official media claim that more than 12,000 small coal mines have been shut down since 2005.